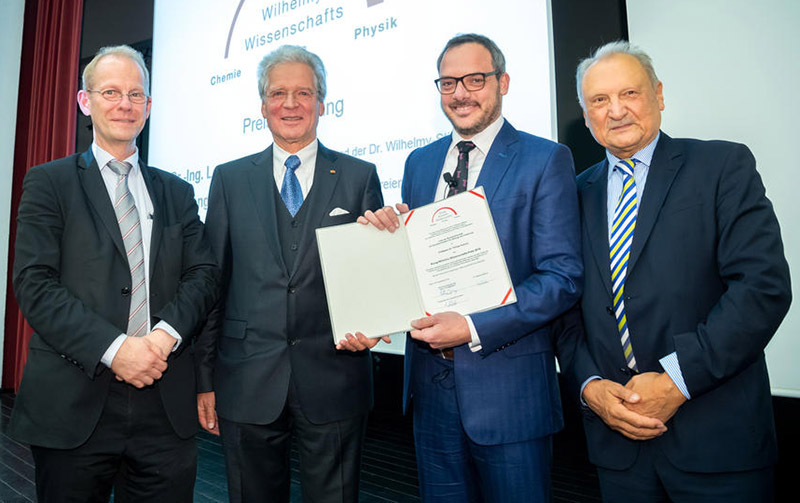 Fellow in Physical Chemistry, Professor Philipp Kukura, has been presented with the prestigious Klung Wilhelmy Science Award for 2018. Professor Kukura was given the award, worth €60,000, in recognition of his pioneering work on the development and application of imaging methods on the visualisation and characterisation of individual biomolecules. The award was presented to Professor Kukura at the Free University of Berlin under the patronage of the German Federal Minister for Education and Research, Anja Karliczek, on 22 November. The Klung Wilhelmy Science Award honours leading young researchers. It is awarded in cooperation between the Otto Klung Foundation at the Free University and the Dr Wilhelmy Foundation. In alternating years it goes to a chemist or a physicist respectively. Various major national and international awards have been bestowed on former recipients of the Klung Wilhelmy Science Award including, on five occasions, a Nobel Prize. Professor Kukura’s ground-breaking research has received recognition from the Royal Society of Chemistry, earning him the 2015 Marlow Award, and he was a finalist in the 2018 Blavatnik Awards for Young Scientists in the United Kingdom. In further recognition of his work, the European Research Council (ERC) has recently announced that Professor Kukura is one of 291 scientists across Europe who will receive funding for their research that, in total, is worth €573 million.